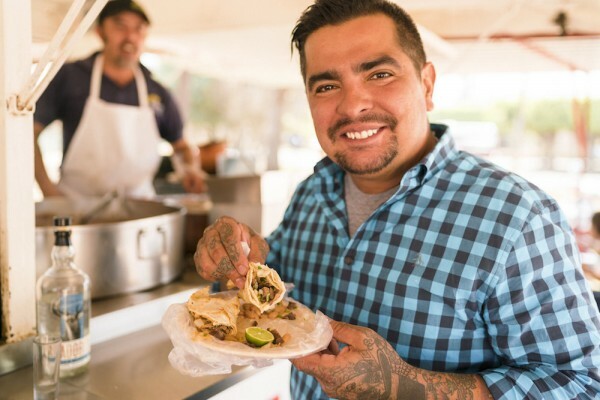 Tequila Cazadores recently announced the launch of Bodega Bites, a Taco Tuesday event series hosted by beloved chef and television personality Aarón Sánchez. The idea behind the series is to highlight local bodega and mercado owners across the country who are known for their taco recipes. Bodega Bites started in Los Angeles and will next hit Austin and New York, where the tequila brand and Sánchez will host a mix of happy hours and late night deliveries featuring the local bodega or mercado's most popular tacos, as well as exclusive recipes from Sánchez inspired by his trip to Arandas, Mexico, the birthplace of Tequila Cazadores. "The U.S. has embraced the taco for many years now, creating delicious variations and inspirations of this classic Mexican dish," said Manny Hinojosa, Brand Ambassador for Tequila Cazadores, via a statement. "However, in light of Hispanic Heritage Month, we want to take it back to the basics, and are thrilled to partner with critically-acclaimed Mexican-American Chef Aarón Sánchez to honor the local bodega and mercado owners who not only reflect Tequila Cazadores' values of taking pride in your craft, but are truly making some of the most authentic Mexican tacos we've seen." Next Tuesday (Sept. 19), the series will stop in Austin, where they will play host to El Rancho Supermercado, whose barbacoa taco will be available for guests to enjoy, featuring fresh corn tortillas, pico de gallo, and salsa. Then on October 10th, the series will end in New York City where bodega Zaragoza will be serving its oven roasted carnitas taco and beef tongue taco. In addition to the happy hours, Cazadores will also hit the streets late night with custom-designed Priority Bicycles featuring full-functioning grills that will deliver Sánchez's exclusive tacos, including Sofrito Shrimp Tacos and Fried Plantain Tacos with Creamy Black Beans and Heirloom Pico de Gallo, to hungry patrons. These tacos were created for Cazadores and inspired by his trip to the tequila's distillery and birthplace in Arandas, Mexico. "I wanted to bring to life the stories and inspiration from my trip to Arandas with these tacos; taking authentic Mexican products from the bodegas and mercados and adding fresh, local ingredients to create delicious tacos that pair perfectly with Cazadores," said Chef Aarón Sánchez via a statement. "I'm proud of my Mexican heritage and excited to work alongside Tequila Cazadores to celebrate our culture." There will be tequila served at all stops as well -- obviously. Guests will enjoy a variety of signature TCazadores cocktails, including The Good, the Bad and the Uglywith Tequila Cazadores Blanco, mezcal blanco, Aperol and pureed red roasted bell pepper; The Cazadores Sangrita, a mix of orange, lime and tomato juice spiked with hot sauce, paired with a shot of Tequila Cazadores Reposado; and Mexican Chardonnay, which is quite simply Tequila Cazadores Blanco served neat in a wine glass. No word on whether or not tacos will also be available via this bodega.